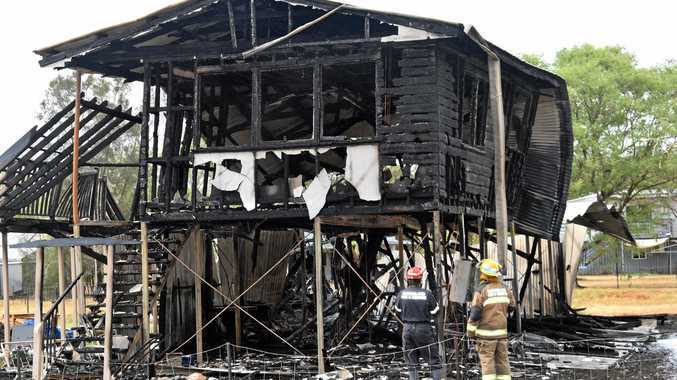 UPDATE: DEBRIS under a fallen bathtub caused a house fire in Laidley to reignite almost four hours after the blaze was extinguished. It is believed the bathtub which fell from the first floor of the property could have prevented the fire crews to fully extinguish the blaze early this morning. Queensland Fire Emergency Services Laidley Fire Station captain Craig Barrett said crews were called back to scene at around 8am. "We packed up and thought we were right, but we got a call back because of a flare up," Mr Barrett said. "We think where the bathtub had fallen downstairs there was some debris underneath it that we didn't get enough water on last night." Emergency services investigating the cause of the fire were on scene when the fire started to smoulder. The cause of the fire was yet to be determined, but Mr Barrett said the house was completely destroyed. "When we arrived the house was fully involved from one end to the other," he said. "The floor has fallen through and most of it has collapsed, the downstairs wall on one side has fallen out and the roof has caved in at the back ." Crews worked hard to isolate the blaze, removing LPG cylinders and other potential ignition sources. "We had an issue with the power line to the front of the house, which dropped across the road, so we had to make to sure that was safe," Mr Barrett said. No one was at the property when the fire started. Emergency services were alerted by two calls from neighbours at 2.42am and 2.44am. It is suspected the occupants of the property were in the process of moving out and the house was only partially furnished. "There was some furniture but everything has been destroyed," he said. Mr Barrett urged all residents to take precautions if they planned to vacate their property. "If they're going to leave their house unattended for any length of time make sure they've turned everything off and isolated all the services so there's no chance of anything catching fire," Mr Barrett said. "It shouldn't be short circuits but anything is possible." Emergency services were still on scene at 10am this morning. FIRE crews battled a house fire for almost an hour at Laidley in the early hours of the morning. Three crews attended the scene to fight the fire, which had engulfed the house on Short Street. Crews arrived just before 3am and extinguished the blaze within an hour. It is suspected the property was unattended at the time of the fire. At present the fire is not suspicious, but the Fire Investigation Unit and Criminal Investigation Branch are working on an official outcome.